Well, it’s official— and let the bloodbath begin. Texas has been growing (this we knew), but by enough to mean that we will get 4 new Congressional seats. Much of our growth has been occurring in suburbs and exurbs, and we’ve been losing relative population in rural areas, so it will be interesting to see how our Congressional and Legislative seats are reapportioned. How these district lines will be drawn are now up to the Legislature, who will draw the maps that they, themselves, will run in. Obviously, this creates a serious conflict of interest, as instead of having voters choose their representatives, we have representatives choosing their voters. Some have guessed that the sudden party switch of the now-tilde-less Rep. Aaron Pena may be due to his desire to run for Congress– getting a seat at the table to carve up a custom-made Congressional seat would certainly make that tempting. And this is exactly the kind of problem that we have when Legislators draw their own districts. Given Texas’ troubled history with redistricting, including but not limited to the illegal redistricting plan forced through the Lege by Tom DeLay and the subsequent flight of Democratic lawmakers to Oklahoma, it is time for Texas to do the right thing and move to a system of independent redistricting. Many states have adopted this vital reform, and Texas has considered this before, including bills in the last Legislative session by Rep. Mark Strama, a Democrat, and Senator Jeff Wentworth, a Republican. Frodo didn’t want to get rid of the ring of power, and it corrupted him, but he needed to get rid of it. Unfortunately, when faced with the choice and standing at the precipice, he failed to make the right choice. He had to have the ring forcibly taken from him, and cast into the fire. I hate to compare “the people” to Gollum, but that’s what we have to do– bit the ring of power off of our leaders’ fingers and destroy it forever, so they can deal with more important issues, like, oh, say, $20-$25 billion dollar deficits and such. Whatever bloodletting occurs over the upcoming redistricting fight (and there will be a fight), it ought to be accompanied by a bipartisan support for an independent, non-partisan redistricting plan. Republican gains in Congress were the major stories for the national media, but it is the party’s gains in down-ballot local state house races that may have created the most lasting protection for the GOP‘s new majority in the House of Representatives. Once every decade, state legislators begin the process of redrawing congressional districts to reflect changes in population. A by-product of this process is that it can serve to insulate representatives from future difficult re-elections. According to the nonpartisan National Conference of State Legislatures, Republicans will now hold about 53 percent of state legislative seats across the country, gaining at least 680 seats this election, the largest gain by either party since the mid 60s. 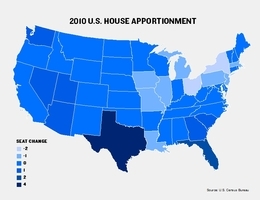 Reapportionment: The number of seats in the U.S. House is fixed by law at 435. Every 10 years, after the Census has counted the population, some states gain House seats, others lose them to reflect shifts in populations. Redistricting: In most states, state legislators, with advice from expert demographers and lawyers, obligatory input from citizens and with the final say of the governor, draw the new congressional district lines. State legislators draw the maps for 383 of the 435 seats in the House. In most cases, governors can veto remapping plans and sometimes force legislatures dominated by the opposing party to alter plans to help protect his party’s incumbents. This will not be the case in Texas this go-round since the Republicans dominate both state houses and hold the governorship. In eight states, bipartisan or nonpartisan commissions handle the task. This is not the case in Texas. Currently, the House Committee on Redistricting is taking public testimony at hearings around the state regarding redistricting that will help shape the districts for both the house and senate of the Texas legislature and Texas congressional districts. TexasVox will post information about hearings in your area as the information becomes available. Click here to read an earlier blog about hearings with links to archived video of hearing around the state that have already happened. If you are concerned about the impacts of redistricting on your state and congressional representation, plan on attending and testifying.